This once-popular drug stock is shunned and misunderstood by most investors. NEW YORK (TheStreet) -- Bristol-Myers Squibb (BMY - Get Report) began 2014 with fanfare and market acclaim. After announcing the sale of its global diabetes business to AstraZeneca (AZN - Get Report) for more than $4 billion, shares of BMY rocketed above $57 on March 5 shortly after the deal was completed. Since then it's been downhill for the company's stock. By June 9 shares plunged nearly 18.5% to $46.51. Some talking heads were calling the stock "dead money" and described Bristol-Myers as a company that had sold its way into obscurity and uncertainty. Its shares closed Monday at $47.27, down nearly 12% for the year to date. Little wonder technical chartist Helene Meisler, the editor of The Daily Swing Trade, wondered how the stock went "from so good to so bad so quickly and no one even mentions it. The fundamentalists were all over it, loving on it, and here it is down on the year." She concluded, "In a market that doesn't get saved all the time, [its] chart measures to $40. In this market I would pay attention to the $48-$49 area. If it cannot recapture that level, then it tells us something is wrong here." So far that observation has proved accurate. But that doesn't mean patient investors with a long time horizon can't consider BMY. The perception that "...something is wrong here" may be based on several factors. Investors have been concerned about the company's drug pipeline and analysts have questioned its short-term ability to grow its revenue number and bottom-line earnings. The company has been going through a purposeful transition for several years. Much of the downsizing was accomplished by selling its non-pharma assets including a wound care company, a medical imaging unit and the spinoff of what is today called Mead-Johnson Nutrition (MJN, Bristol's lucrative infant nutrition company. The metamorphosis was so dramatic that one industry analyst described it as the most stunning witnessed in the drug sector. Jami Rubin with Goldman Sachs described Bristol's overhaul as taking the company "from a big, diversified drug company to a highly focused biopharma firm." Now let's look at a chart examining how the stock price of BMY behaved during the past five years. It is both telling and promising. Since 2009 the stock soared nearly 190% before the recent correction. Annual revenue and free cash flow dropped in mid-2012, undoubtedly the results of the company's reduction in size and products. Notice the red line in the chart. 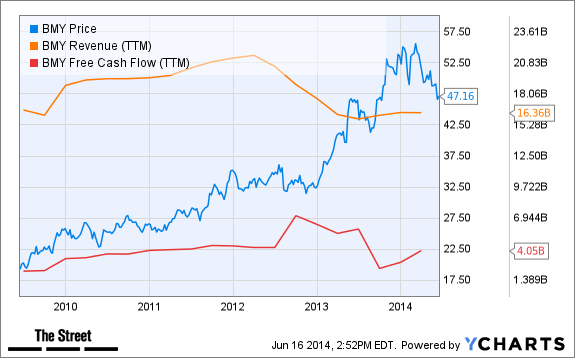 The trailing 12-month free cash flow is rising again. That should help Bristol-Myers maintain its 3.06% dividend payout yield. The company is morphing into a major player in the immuno-oncology drug category. My research suggests Bristol-Myers has the largest number of immuno-oncology drugs in various stages of approval. The company is also becoming a leader in biologics medicines, like the one it's developing to treat rheumatoid arthritis. These specialty drugs are promising because they're designed to work with the body's defense system. The good news for shareholders is if approved for use, each of the drugs Bristol-Myers is developing can be financial blockbusters. That takes time and the market knows it. That's why the stock is an appropriate investment theme for long-term investors. Shares may face some headwinds for now which may push the stock price towards the 52-week low of $41.11. Then again, the June 9 low may be the base. Either way shares look attractively priced for patient investors. The dividend is adequate and with my 12-month price target of $56 there's ample upside potential. At the time of publication the author had no positions in any of the companies mentioned. Marc Courtenay is a financial research analyst and the founder of Advanced Investor Technologies LLC as well as the publisher and editor of www.ChecktheMarkets.com.